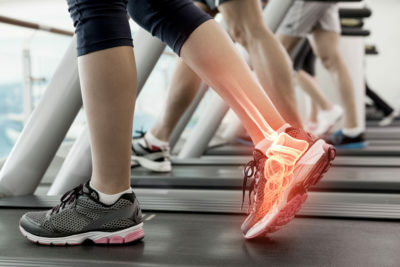 “It’s just a sprain.” Many of us have heard these words, or have said them ourselves, after suffering an ankle injury. This common injury is often treated as an uncomfortable yet unremarkable inconvenience; however, in recent years research has shown that ankle sprains can have a long-term impact on joint stability, activity level and the likelihood of suffering another ankle injury. Why Are Athletes at Risk? The relatively small ankle joints must support the entire body, and this burden is further challenged by repetitive sports maneuvers like jumping, running, cutting and pivoting. Quick changes in direction can be very hard on ankles. Athletes who play soccer, football, volleyball and basketball have an especially high risk of sprains. Sprains occur when the ligaments that support the ankle are stretched or torn. Sudden, awkward movements that twist or roll the ankle outside of its normal range can cause a sprain. Although athletes are at a special risk for developing ankle sprains, everyday actions like stepping off a curb wrong can injure the ankle. Are Some Sprains Worse than Others? Grade I ankle sprains involve a partial tear of the ligament and result in mild pain, swelling and stiffness, and may cause some joint instability. Grade II ankle sprains involve an incomplete tear of the ligament and result in significant swelling, bruising, and moderate pain and joint instability. Grade III sprains involve a complete tear of the ligament and cause severe swelling, bruising and pain; the injury prevents walking or bearing weight on the foot and ankle. Why May Sprains Become a Chronic Problem? Once ligaments are stretched they never return to their normal shape. This can create chronic instability. Persistent problems with stiffness, balance and coordination may result. Ankle sprains have been linked to a greater risk of arthritis and other health problems. What Should I Do if I Think My Ankle Is Sprained? Apply ice to the site right away. This will help with the pain and swelling. Seek help as soon as possible. Prompt treatment will help the injury heal more effectively. Follow the treatment plan carefully. If you have questions about your care, contact your doctor. You may be given a brace or crutches for your sprain; be sure you have been instructed on how to use these aids. Rest—Avoid walking or other weight-bearing activities that cause pain or swelling. Ice—Apply ice for 20 to 30 minutes three or four times per day. Compression—Use a compression bandage or Ace bandage to support and immobilize the ankle. Elevation—Place the ankle on pillows. For the first 48 hours raise the ankle above the heart. In addition to the R.I.C.E. protocol, your doctor may recommend nonsteroidal anti-inflammatory drugs (NSAIDs), an orthotic boot, physical therapy, and/or steroid injections. In cases that do not respond to routine treatment, surgery may be indicated. If you have suffered an ankle sprain or other sports injury, please contact Hampton Roads Orthopaedics & Sports Medicine for an appointment at (757) 873-1554. Our specialists are uniquely qualified to diagnose and treat all levels of ankle injuries.